It's easy! Just 1 cup keeps the cravings at bay. Created from the highest quality organic cacao beans, the carefully selected ingredients in Sumabe® Hot Chocolate have nutritional benefits to assist in healthy weight management and overall well being. 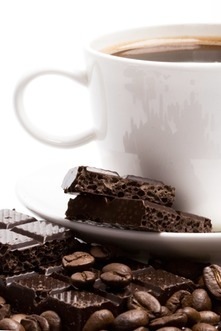 Sumabe® Hot Chocolate should be used in conjunction with a healthy diet and regular exercise. 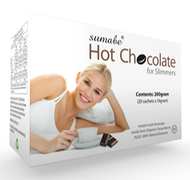 Sumabe® Hot Chocolate is an instant style hot chocolate that can supplement your current weight management routine. Designed specifically to satisfy sweet cravings and stem the urge of snacking and help you feel fuller for longer. A saviour for the afternoon or evening or whenever you need it most. Dissolve 1 sachet in a cup with 200mL of boiling water. Add low fat milk or sweetener as desired. Alternatively, blend with low fat milk and ice for that extra treat. Recommend one cup per day. Organic Cacao Bean Powder (60%), Mushroom Powder (Ganoderma lucidum), Rosa Petal Extract, Herbs, Dried Lotus Leaf Powder, Soy Powder.